West Jackson through the WESToration Initiative. happen, and people can’t always commit to their RSVP. But you know what? People came…and came…and came! So many people came that Koinonia Coffee House’s parking lot became a sea of cars. Our first WESToration event was a success with a coffee house packed with people and vans packed with folks eager to tour the potential of West Jackson. One of those people was Linda Liddell. Linda was born in Chicago and after spending time in Milwaukee, Wisconsin, her family moved to Jackson in 1973. When they first moved to Jackson, Linda’s parents rented a home on Miller Avenue in North Jackson and eventually came to rent a home on Arbor Vista Boulevard in West Jackson in 1974. Finally, Linda’s dad became frustrated with renting and said “enough of that” and the family purchased a home a couple of streets over on Voorhees Avenue. her Realtor, Michael Lewis of Leah Cim Real Estate, on November 23rd, placed an offer on the home the next day, and received a response on her offer on November 27th. She closed on the house at 9 a.m. on December 31st. 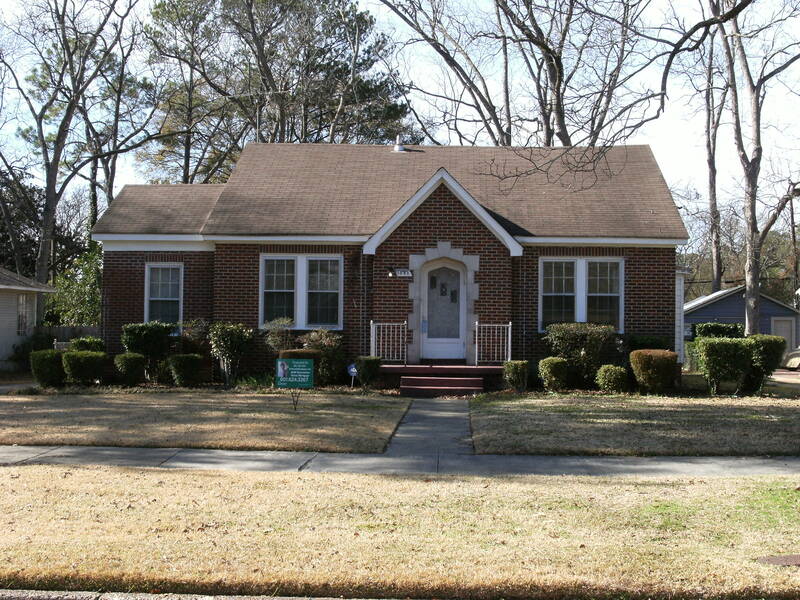 Linda’s 1772 square feet brick home was built in 1939 and has 3 bedrooms and 2 bathrooms. It includes a living room, dining room, study and has some neat features including an arched front door, built in shelves, a cool old telephone nook, an even cooler slide out laundry hamper in the hallway, and one of those nostalgic mail slots that’s built into the house. It also includes a 2-car detached garage with a 456 square foot apartment above it (this brings the total square footage to 2,228). insulation, update the old appliances, and install a tankless water heater among a laundry list of other improvements. She also plans to do a massive renovation on the detached garage/apartment with the funds. Linda will be a great neighbor for the Pecan Park neighborhood. Her daughter and two grandchildren will live in the house with her and the garage apartment will be in tip top shape when her other daughter, who lives in Houston, Texas, comes to town to visit. She has done some great things in the community. One of the most moving things is the fact that she used the money that she made working overtime at the post office during the Christmas season to take four Pecan Park elementary students shopping for new outfits. She also has spent many Friday mornings in the past taking sausage and biscuit sandwiches to those in local homeless shelters for breakfast–all out of her own pocket. She even takes time to have lunch with her grandsons at school every week! We can’t wait to see the finished product of Linda’s home, but until then, she was kind enough to let us take some photos of the current condition of the home. You can find the pictures below. If you’re interested in learning how you can use the 203K loan to renovate a home in West Jackson for yourself (like Linda did), join us for our 2nd WESToration event. The event will take place on Saturday, January 29 at 9:30 a.m. at Koinonia Coffee House. For more information on this event and/or to RSVP, please call 601.979.2255. What a great house, and thanks for showing it off! I love the details like the pointed arch door, that double shelf on the phone nook that gives you a place to put the phone book under the phone, and that very cool exterior light fixture. It really is a cool house! It was nice meeting you yesterday by the way. Bloggers unite!!! And it still has its solid wood windows–don’t let anyone replace those with cheap vinyl. They aren’t more energy efficient.